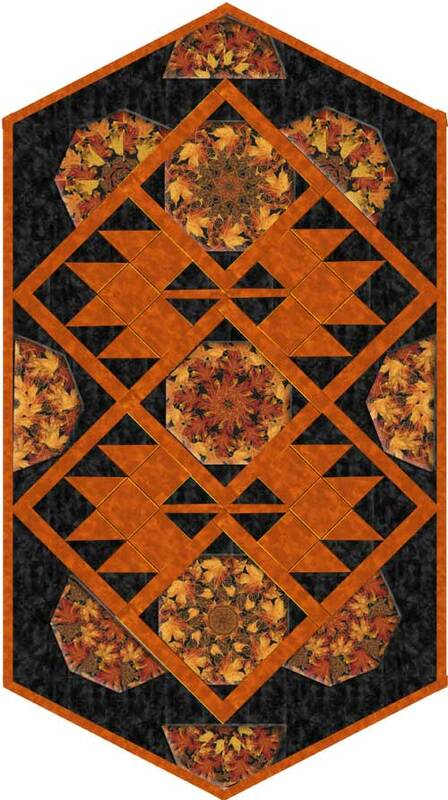 Fall Comes to life with kaleidoscopes and leaf blocks in this 29 X 69 inch Table Runner. The Kaleidoscopes are pre-cut from Gather Together by Timeless Treasures with tumbling oak and maple leaves. This autumn print remind us ofjack o' lanterns and pumpkin patches rich with harvest color. You can almost feel the cool breeze of the changing seasons as you work with this foliage theme. Gather Together by Timeless Treasures Metallic Harvest Leaves Pattern Harvest-CM2092-Black. Kit.Includes the Precut Blocks and fabric and binding to make the table runner. Batting and backing NOT included.